Few Drum Corps International products are more coveted to the avid drum corps fan than the annual World Championships DVDs. Since the 1970s, Drum Corps International has produced television broadcasts of its World Championship events. Starting in the 1980s as VHS became popular, performances became available to the average drum corps connoisseur, and after updated technology became available, the very first DCI DVDs were offered in 2000. In 2006, the full line of DCI World Championships DVDs includes six discs spanning performances of all competing Division I corps in addition to the 12 Division II & III finalists. Several of these DVDs give viewers access to multiple video angles and audio tracks so they can call the shots they want to see and capture their favorite moments from the drum corps season. are made up of three different volumes. More than 100 people have a hand in making the annual DVD products a reality, accounting for well over 10,000 man hours worth of work. Take into account the additional work that is put in to create three separate television broadcasts on ESPN2 (two-hour version and two one-hour segments) and a five-and-a-half hour live theater broadcast, taping and producing anything television related to the DCI World Championships is an impressive feat. From June through November each year, Drum Corps International and Tom Blair, Inc., the production company for all DCI television products, are hard at work on a drum corps season's broadcast products. The following is an inside look at the DVD-making process from start to finish, and some of the steps that are involved to finally put the finished product in consumer's DVD players. Planning and logistics June-August Outside of general setup logistics for the production crew prior to the DCI World Championships, like hiring staff, travel arrangements and developing feature video segments, extensive research is done on each of the corps' performances. This helps the production crew's directors familiarize themselves with the corps' programs and to map out the best camera shots and angles to capture during the show. "We watch corps as early in the season as possible and as many times as possible," says Tom Blair, producer and director of the World Championships productions. Blair brings more than 34 years of drum corps experience to the program. He was a member of the Glassmen and the Cavaliers in the late 1970s and has worked on Drum Corps International's television programs since the 1980s. "I try to see all of the corps at least three or four times before the World Championships. The first couple of times I like to just watch and get a sense of the show. I also try to connect up with as many drum corps staff members as I can for their insight. Then, I'll watch at least two performances where I'll record my own commentary on how I want to see the show directed," says Blair. As part of these preparations, each notable visual and musical moment is timed to the second and included in a written series of production notes. This becomes a reference point for all tapings of a corps' performance. "A drum corps performance is like a 10-ring circus. We research the programs by watching the corps and talking with staff members to determine the best shots to capture," says Blair. "We do have to use our judgment throughout, determining whether we should use a high camera shot here or a close-up there, but that's also why I love the DVDs. For those that want high camera all the time, or for those who just want to watch the color guard, there are multiple options to switch between." performance to stay on top of the action. 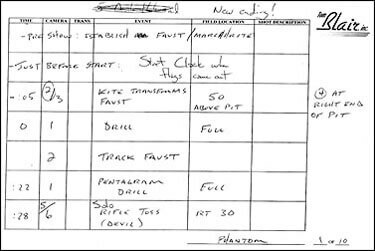 Set of production notes (PDF) from the Phantom Regiment's 2006 show, "Faust." Each moment, the time it occurs, the camera that will be used to capture that moment and any additional notes are included. If you already own the 2006 World Championship DVD, compare these notes to the final product. Each performance brings a slightly different set of circumstances, and quick on-the-spot decisions not always included on the production notes often have to be made. Taping the performances August More than 70 people make up the production crew for the World Championships; from producers and camera operators, to audio and graphics specialists. Many of the crew members arrive on the Sunday before the week of the World Championships. This television truck serves as the command center during broadcasts. While a corps is performing, some of the most exciting action related to the broadcast happens inside of the TV truck just outside the stadium, which serves as the command center for the broadcast. Inside, the director sits in front of more than 100 screens, and uses those views to select the appropriate cameras to capture the moments that were outlined during the research process. Each new stadium presents a new challenge and specialized setup for the equipment, and because of that, it takes months of prep time to get to this stage. 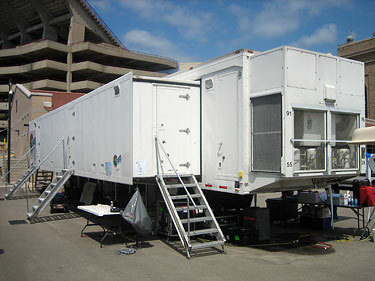 The TV truck had to be delivered and set up, video cables had to be pulled through conduits in the stadium to the appropriate locations, and the 11 cameras used during taping had to be positioned. Inside the TV truck, assistant director John Flower watches a stopwatch and his production notes to call out upcoming performance moments to director Jeff Clark, who sits in the middle. Hear what it's like to be inside the television truck in this video clip of the Cavaliers' performance at the 2004 DCI World Championships. In this clip, Tom Blair calls the shots from the director's chair. Also heard is the assistant director who calls out the upcoming drill and musical moments for the director. The assistant director sits to the director's left in the truck. He watches a stopwatch and the production notes carefully so that he can keep track of any upcoming drill, music or solo moments. The director then calls all of the camera shots. He "readies" the cameras and then "takes" or "dissolves" to the camera shot that he wants. The technical director on the director's right side in the TV truck pushes the buttons to make the camera switches happen. All of this is fast paced. "It's great to be in the truck during live performances especially when everything is working. When the drum corps is having a great performance, it soaks into everything. It comes all the way down the wires into the speakers and into the monitors, and you can have a great performance yourself while covering it. It's incredibly exciting," says Blair. He added: "So many of the people who work on the DCI broadcasts have done it for so long now that they get fired up to do the show every year. When you're a hand-held cameraman on the sidelines and the Madison Scouts are being the Madison Scouts, even if you have no drum corps background at all, it's hard not to get drawn up in the excitement!" Video and audio editing begins August-September Just one day after the completion of the World Championships, video editing begins. 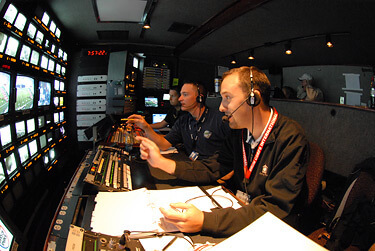 Tom Blair and members of his crew spend two extra days editing outside of the stadium in the television truck, before moving back to Blair's Chicago-based facilities. 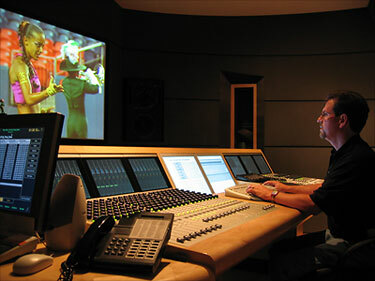 In the studio, Tom Blair monitors Santa Clara Vanguard's surround sound mix for the 2004 World Championships DVDs. Even before work can begin on the DVD products, though, the editing for the ESPN2 television broadcasts which air in mid September must be completed. Simultaneously, extensive audio work is done to prepare 5.1 surround sound for the DVDs. More than 40 tracks of audio are recorded during the World Championships and are used to create the final surround sound audio mix. Other audio segments like designer commentary tracks are recorded at this time and become added bonuses to the final DVD product. 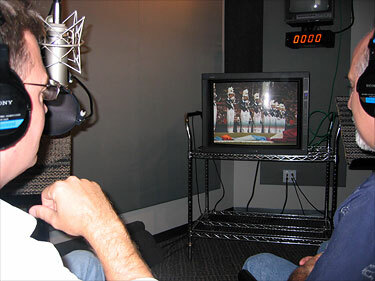 Doug Thrower and Mitch Rogers of the Bluecoats record their commentary in the studio for a past year's World Championships DVD. "Something interesting that people might not realize, is that the audio levels used on the DVDs are consistent to how they were during the live performances. If the champion corps sounds 25 percent softer than the corps that took 15th place, it's because the 15th place corps was louder," says Blair. "The audio mix is very consistent for all of the corps, and if one corps seems louder than another, that's how it was during the live performance. We keep the 'audio playing field' level." DVD menu graphics and product package artwork September The physical DVD packaging as well as the menus that show up on a television screen when the DVD is played, require the creation of various graphic elements. 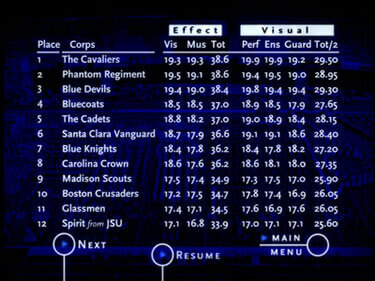 In addition to screens that show which corps is on any particular DVD, the discs also contain menus with score recaps, corps contact and sponsor information. A menu screen from the 2006 World Championship DVD. "There's a lot of detail work in this phase of the DVD creation, and a lot of room for error that goes along with it," says Blair. "Multiple people check to make sure every score is correct on the on-screen recaps and we even go as far as calling all of the phone numbers listed on the contact sections to make sure that they are right." For the product packaging, text and graphic elements have to be written, edited and proofed before sending to the printer. Great care is taken to make sure that all music licensing and copyright information for each corps' production is up-to-date and noted correctly on the package inserts. A proof copy of one of the 2006 DVD's disc artwork. PDFs of the DVD package and disc artwork are used to proof text and layout. Encode video and author DVD September-October Before the first working test discs of the DVD are created, the video needs to be "encoded." Encoding and compressing the video is what allows it to fit on something as small as a DVD. The original video is high-end broadcast quality and is much too large to fit onto a single disc. "A considerable amount of time is spent tweaking encoder settings so that the video quality can be as high as it can on the DVD format. In this activity, because there's so much movement, so much color and so much action going on at the same time, it is always a challenge to find the best settings to use. Whether the stadium has grass or artificial turf, the type of lighting it has and even how its back stands look, all factor into the encoding process," says Blair. Next, the DVD has to be "authored," meaning that all of the different video segments and audio tracks need to be put together in a functioning format. The DVD author takes the audio, video and graphics, and essentially creates what we know as the DVD. The top-six performances on DCI World Championship DVDs all contain four video angles (high camera, multi-camera, percussion, color guard) and several audio tracks. Time is spent making sure that each video track is in synch with each audio track, and this is what allows the DVD user to switch between any angle "on-the-fly" while watching. 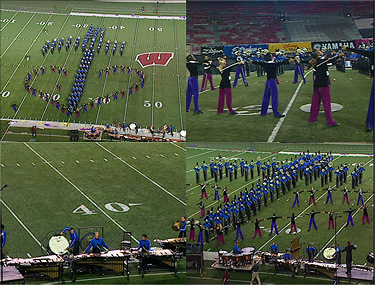 These shots from the Blue Devils' 2006 World Championship performance, capture the four different angles that can be watched separately on the DVD. Clockwise from left: high camera, multi-camera, color guard, percussion. "These DVDs are so much more complicated than your typical feature film. You don't have four angles running simultaneously on 'Batman Begins.' There are very few examples that push a DVD's capabilities like we do with this product," says Blair. Test discs created and checked October Test discs are the first proof of the complete working DVD product. Each disc is carefully watched in its entirety for any problems. The disc functionality is checked so that everything works, like making sure that when the "menu" button on the DVD remote is pressed, the user is taken to the menu page. It sounds simplistic, but each disc's programming is created from scratch and each function has to be defined and verified. Each program is watched at least four times on all different video angles and audio options to make sure that everything is correct. Master copies sent for molding, check discs created and approved November-December When everything is OK and ready to go after the test disc stage, the final version of the DVD product is "mastered" so that it can be used to create the template for all copies of the DVDs. Encryption is put on the discs as a copyright measure at this point as well. 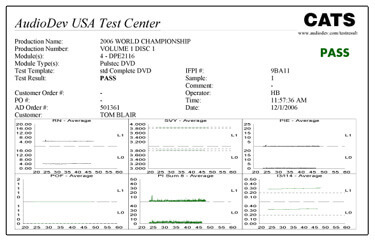 Unlike a recordable DVD that you may throw into your computer to burn a home movie, commercial grade DVDs—like the World Championship sets—are molded. During replication that mold is used to "stamp" or copy the DVDs making it playable for the consumer. looks like from start to finish. From the mold, a final set of "check discs" is created. This set is used to make sure that the replication matches what was sent to the manufacturer on the test discs and that no data was lost in the process. In a similar proofing process as the test discs, the content and functionality of the check discs are examined. As an extra verification, check discs are put into as many different brands of consumer DVD players as possible. The World Championships discs are checked in as many as 20 different players, from a computer DVD drive to an Xbox gaming system to make sure that they will work properly. The check discs also are sent out for independent optical testing of the disc. Through these tests, the discs are given a grade rating which helps determine whether or not it has been replicated correctly. World Championships DVDs are subjected to independent optical testing to make sure that they work correctly and are of high standard. That disc came back with a passing grade. Replicate, assemble, package and deliver final product November-December After all content is approved, and the replicator (company that will make all of the copies of the discs) has the final masters in hand, it takes approximately 14 days before the finished packaged DVD product can be shipped to consumers. 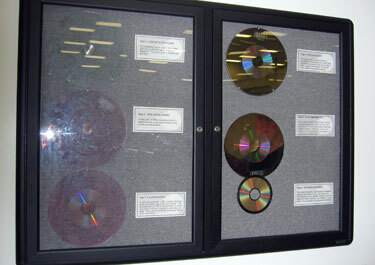 These steps include the replication (copying) of more than 40,000 discs just for the Division I DVD products, disc screening (printing the graphics on the top of the disc), package assembly and shipping. Order shipping and handling Late November-December Just prior to the arrival of completed DVDs at the Drum Corps International headquarters in Addison, Ill., office staff members begin to assemble boxes and packing materials to fill the thousands of pre-orders that are taken starting in August. When the first shipment of DVDs arrive at Drum Corps International, customer orders are processed and inserted into the individual packages before being labeled and shipped across the country and the world. 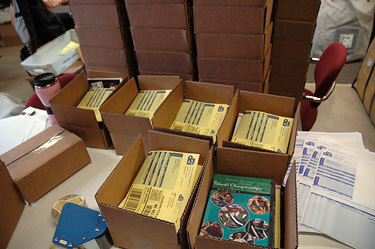 Drum Corps International DVD products are shipped to more than 10 countries, including Thailand, England and Japan. Drum Corps International's warehouse facility. "We processed and shipped more than 2,500 pre-ordered DVDs this year," said Ric Oberlin, Drum Corps International's merchandise manager. "That process took as long as two weeks just a couple of years ago and this year, thanks to a lot of hard-working help in the warehouse, took us just two days." The cycle starts again December and beyond Already, Tom Blair and some of his crew members have traveled to California to determine the best spots for their cameras and equipment at the Rose Bowl Stadium in Pasadena, site of the 2007 DCI World Championships. Also at this time, the success of the 2006 broadcast products is evaluated and ideas are thrown around for future refinements. In the end, the World Championship DVDs become the definitive historical record for any given year in Drum Corps International. Drum corps members, fans, students, and more, can look to any of Drum Corps International's DVD products, which date back to 1974 with the "Legacy Collection," to experience first-hand what a show was like, or to spark a memory that may have been collected while watching a show live. "I remember competing against the 1978 Santa Clara Vanguard, but what I remember about their show is what I saw on TV then or on the DVDs now," says Blair. "We take great pride in putting each year's broadcast together, and it's incredibly important in an historical sense for us to get it right." And as technology changes, just as drum corps audio recordings went from vinyl, to cassette, to CD, to Internet downloads, Drum Corps International will surely continue to refine its video offerings. Is there high definition (HD) in DCI's future? "Of course," says Blair. "The higher cost of an HD production is a challenge, but I have always thought drum corps would be the poster children for HD. Whether in the theater, on ESPN HD, Blu-ray or HD-DVD discs, I can't wait until we can make the move."